y this is in white …shouldn’t it be pink? It was 12.25pm on hot summer day in Bangalore. 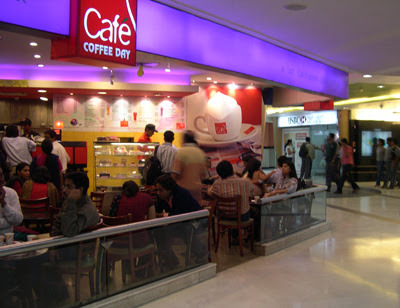 DJ was in CCD in Forum Mall. He usually goes to Kalmane Koffee when he goes to Forum. But this wasn’t an usual day. Scientists say chocolate releases endorphins in the brain, which act as pain-relievers. But DJ knew that he will need more than Chocó-donuts to get over this situation. He wanted to tell someone but at the same time he thought it won’t do any good. He almost updated his Facebook status but somehow he held it.He wanted to call RJ and inform.But he knew RJ would be sleeping and wakes up only around 2pm.So he had to pass time till then.He would be the right person to discuss something like this. He didn’t want to call anyone in home and spoil their day.It can wait.He has lots of time now. DJ was surprised at himself for being so calm in this type of situation. He wasn’t flipping out. Just then a “WOW” passed by CCD. WOW was the term DJ and his friends used to refer for hot babes.Not all the pretty or beautiful girls are termed “WOW”, it was only for the girls that every guy would like to flirt with(or more) but not marry. DJ didn’t go WOW when he looked at her.Just then he realized he wasn’t calm, he has become numb probably a bit shocked. He wasn’t feeling pain because he wasn’t feeling anything at all. He suddenly had the urge to run out of the mall to the open road…just like in his dreams. Then he remembered how hot it is outside …may be i will run after having this Lychee Chill. The donut reminded him the first time he met DG @ CCD. It had been quite some time since DG and DJ spoke to each other, due to busy work timings, they preferred talk more than gtalk. DJ couldn’t believe wat he was seeing …then he broke into a silent laughter…. “hehehehe why i am surprised abt this” and checked the message. St Johns is a famous hospital located near Madiwala, Bangalore. Incidentally even Forum is in Madiwala. Less than 20 seconds later , DJ was literally running on the open road towards St.Johns….exactly like he wanted. Even though DJ came running,It looked like DG needs some air as she was talking breathlessly…DJ kept on looking at her..her face had so much emotions running…she was in pain because of the cut, she was happy becoz she can bunk office..she was little surprised to see DJ @ short notice..she was excited to tell the story to him and little tired after telling it. DJ thought she had met with some accident (St.Johns is not a small clinic) and so he ran to see her and help her, comfort her. But it was a just a small bruise and she was actually fine and started interrogating him as usual. He couldn’t control it any longer.DJ started laughing out loud.DG got really irritated & screamed. “heyy wats so funny?? i am in pain and you are laughing?? SSHHHHHHHHH aachey ogey mathadri..ithu enu hospitala? coffeeshopa? A ward boy screamed at them to be silent.So DJ started the recovery process. “How is RJ doing ? They were in Kalmane Koffee exchanging pleasantries.Its been quite sometime they had a long talk. DJ somehow felt something strange about DG , but he couldn’t figure out wat was it. DJ: its nice..its good….wat was that u wanted to tell me? DJ: u r engaged now?? DG: no not yet formally…the engagement is next month..i thought i will tell everyone once the dates are fixed. DJ: is it? i mean seriously ? is it? DG: i am telling u i am getting married you didn't congratulate me…u dint ask me abt the guy ..u didn't ask me how excited i am….i knw its all of a sudden..but at least for courtesy sake tell me you are glad to hear the news. DG: ….so that’s all i wanted to tell you…happy now? DG: you don’t seem very glad abt it… are u upset or something? DG: hehhehee who told you that… i will still kill you only. DJ: hehehehe hmm…i wish RJ was here…. DG: can u plzz tell me clearly? wat are talking abt? DJ placed the white envelope on the table..
DG: DJ!!!! just tell wat the hell this is about?? DJ: I got fired today. Diese Replik der Pariser Familienschuhe ist von perfekter Qualität,balenciaga schuhe damen verkauf sehr angenehm zu tragen. Tragen Sie diese Schuhe auf Reisen, nicht müde.günstig kaufen Balenciaga damen pumps Ich habe diese Website meinen guten Freunden empfohlen, sie sind sehr glücklich, solche preiswerten Pariser Schuhe zu kaufen.